The wait is finally over! Introducing the pre-construction Burnaby Gilmore Place Brentwood condo master planned community by Onni! This is Burnaby real estate’s most anticipated new development for 2017. Get more in one place. Gilmore Place Burnaby: a master planned community that will transform Burnaby’s western gateway into an incredible urban hub for residents and visitors alike. Featuring Western Canada’s tallest residential tower, the seamlessly integrated Gilmore SkyTrain Station, world-class shopping and entertainment, convenient office space and luxurious residential towers, the new presale Burnaby Gilmore Place Brentwood condos will redefine metropolitan living in one of Burnaby’s most up-and-coming and very exciting new neighbourhoods. Live above your own city centre with panoramic and stunning views, contemporary and modern finishes, spacious floor plans and of course, unrivalled amenity spaces exclusive to residents at Gilmore Place Burnaby. Another great feature of the new Burnaby Gilmore Place Brentwood development is that the developer is Onni, one of the most trusted and well established builders in the Lower Mainland. Brentwood’s evolution is just getting started and the Gilmore Place master planned community will play an integral part to the excitement, accessibility and affordability of the region. Coming soon to Brentwood is the Burnaby Gilmore Place condos, where you will find a 12 acre master planned neighbourhood at the southeast corner of Gilmore and Lougheed. Located next to the Gilmore SkyTrain Station and connected to new office space, retail space, shopping and parks, the Gilmore Place Brentwood condos will also be home to Western Canada’s tallest residential high-rise tower. Can you imagine the views? 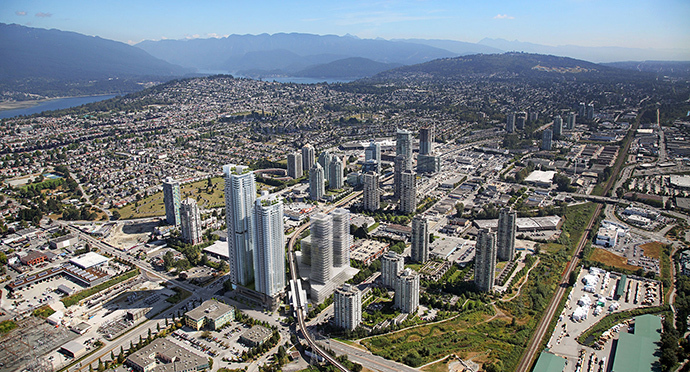 Although the 700 metre tall flagship tower will be amazing, the entire Gilmore Place development will provide unparalleled connectivity to everything in the Lower Mainland, especially in Burnaby and Brentwood. Not only do you not have to cross the road to get to the SkyTrain Station, but you have access to Highway 1, the Central Valley Greenway cycling route and much more. Phase 1 Gilmore Place Brentwood condos will feature three towers and will add 1,500 homes to the area in addition to approximately 300,000 square feet of new retail space. With public plazas, cafes, boutique stores and a landscaped plaza, a sense of community will be there as soon as it is finished. There will also be a grocery store, banks, and other services. The Brentwood Gilmore Place amenities will also be superb. There will be an exclusive 75,000 square foot indoor and outdoor amenity area with a fitness centre, fully equipped entertainment lounge with chef’s kitchen, indoor and outdoor swimming pool, a hot tub, spacious rooftop barbecue and outdoor dining areas. There will also be a dual lane bowling alley with its own bar area. Nearby, residents will also have easy access to the Shadbold Centre for the Arts or Burnaby Village Museum. Top ranked schools and universities such as SFU and BCIT are also nearby. Gilmore Place is the new gateway to Brentwood Burnaby. YOU CAN IMAGINE. Introducing your every desire integrated into one truly magnificent living space. This convergence of residential and retail is located in one of the most accessible and thriving neighbourhoods, connecting Burnaby to the Lower Mainland. With cutting edge amenities and luxurious living spaces, Gilmore Place is a masterpiece of lifestyle, commerce, recreation and much more. Located at the corner of Lougheed and Gilmore with easy access to Highway 1, Gilmore Place is connected to absolutely everything. Hop on the SkyTrain at your front door and be downtown Vancouver in 15 minutes; ride across the city’s extensive bike path network; or, head to the North Shore for a weekend hike. Stroll through pedestrian mews and shopping areas, pick up fresh groceries or dine out with friends. Live above your own city centre, in your elegant new home that offers panoramic views, smart design, contemporary finishes, and unparalleled amenity spaces exclusive to residents.